TANAKA, Asami and TANAKA, Anri (2018) Wa-Kosho! Learn and Discover by seeing, touching, and feeling. Paper presented at: IFLA WLIC 2018 – Kuala Lumpur, Malaysia – Transform Libraries, Transform Societies in Session 153 - Poster Session. An ongoing issue for our library is "What should the role of library services and preservation be?”, "Who do rare books belong to?”. In 2014, we opened Rissho University Rare Book Library, where patrons can freely access more than 38,000“Wa-Kosho”, Japanese antiquarian books, on the open shelves.Wa-Kosho are made by traditional bookbinding methods generally before the Edo period (Pre 1868). In many libraries, these are kept in closed stack room as rare books. One of the reasons is that many librarians have the responsibility of protecting Wa-Kosho loss, damage, mold and insects. However, the only way to understand the true charm of Wa-Kosho is by seeing and touching them directly. We welcome you to experience and discover Japanese traditional papers, ink, colors, characters, illustrations, binding, thread, and paste several hundred years old. 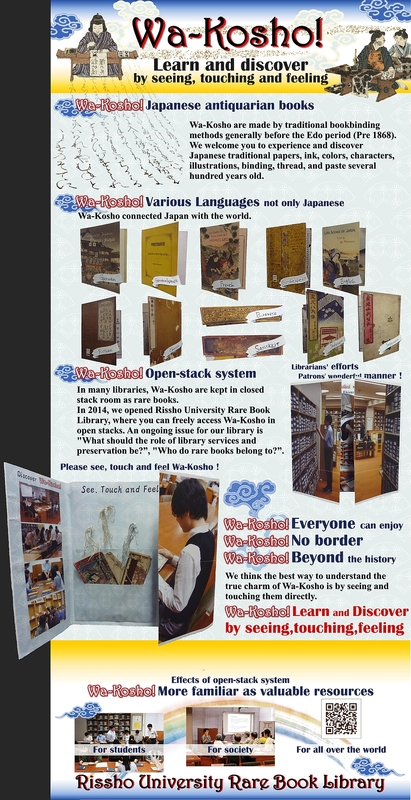 Of course, we also hope you use Wa-Kosho as valuable sources for study and learning. We have had a good response to our free access to Wa-Kosho not only from libraries but also museums and art galleries. 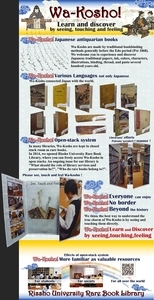 Through this opportunity, we can convey the charm of and mystery of Rissho University Rare Book Library and Wa-Kosho.